I was really thrilled with some of the jokes in these two episodes! I was laughing here and there and having a grand ol' time, even if there were inherent problems with the agendas of these storylines, the first two of the seventh season of Futurama. 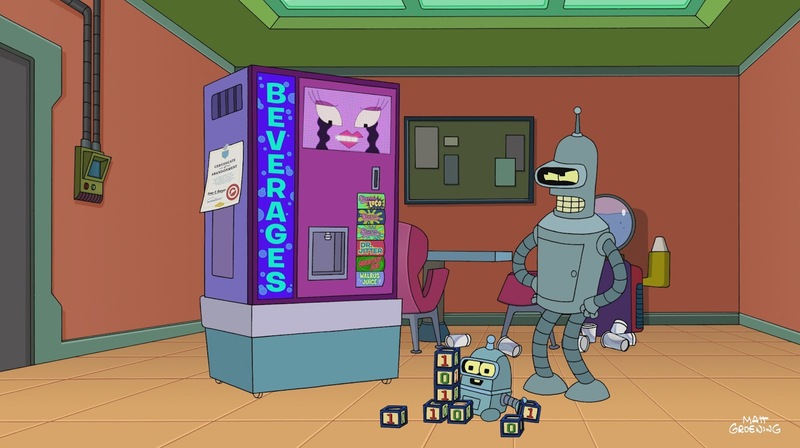 I found "The Bots and the Bees" to be pretty hilarious on the whole, even if it was plagued with pokes at deadbeat parents and had to show Bender be compassionate in order to achieve the status quo by the end. On the other hand, "A Farewell to Arms" had its moments but was a but too "spoofy" for me, especially when the Mayan calendar and 2012 being the end of the world are themes that are popping up every place you look. But, that's just me. Let's hear what you thought and what you hope to see from this season! Fox Film Corporation. All Rights Reserved. Futurama "A Farewell to Arms" (S07E02): Fry and Leela are out for a walk when she steps into a puddle and an octopus attacks her. [you know, all in a day in New New York!] The Professor is launching a weather balloon to gather more data, accidentally bringing Fry's only pair of pants with it. [so many possible things to say here...] Fry shoots down the balloon to save his bottoms, but a badger steals the pants and brings them down a hole. Fry lubes up and follows, only to find petroglyphs. [nobody else needed grease to get through the hole??] Leela breaks her leg but Fry gets his pants back... though now has no other clothing, having removed his to build a rope to climb down to rescue Leela. [one of those moments where you're just shaking your head...] They find a pyramid and bring back a big Mayan/Martian calendar, which Amy reads to say that the world will end in 3012, which fits a bit with the catastrophic sun cycle that the weather balloon detected. [what's with the dig on Tron: Legacy?] Amy finds out that there's a special rocketship underground that they might be able to use to save themselves. ["I used to drive around town in a mausoleum." ... what the...??] The Professor wants to save others, too, but Zapp shows up and stops them, bringing them before Nixon and the heads, who decide that a "selection machine" will choose who will go. [not that it's impartial.. Amy gets in because she was in the same sorority as the machine, and Fry gets in because the machine likes his pants.] Leela isn't accepted because they don't need multiple pilots, and Zapp is already on-board. They load the ship and take off, thirty thousand people in tow! Bender stays behind because there's going to be chaos. [haha. bender going overboard with the looting was stupid, though.] In an act of love, Fry takes Leela's picture and changes it so that she gets on, only realizing later that he's not present. [but he got "accepted again" and a second ticket... so why weren't they both aboard?] After landing on Mars, they build a city, complete with a monument for the scared people they left behind. [freaky. though not as disturbing as Amy's parents trying to charge people admission to the planet.] SingingWind, a Native Martian, shows up to let them know that it's Mars that's getting destroyed, not Earth! He takes off as Amy defends her misreading of the calendar. [...oops!] Mars begins to be blasted out of its orbit, but everyone jumps at the right time and makes it... except Leela, who can't jump. [you're KIDDING me... this is so ridiculous! but I laughed at "pina skulladas" !] Fry tries to save Leela but rips out her arm, losing his almost immediately afterward. In the end, the janitor saves Leela and the Professor clones some arms for them, while their own severed arms float off into space, holding hands.